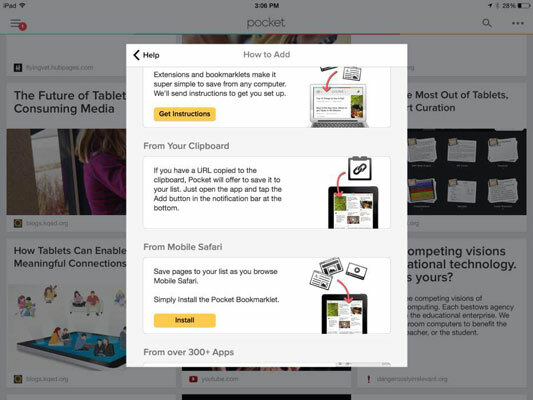 Pocket is one of the most popular of a slew of programs for saving and reading web content on your iPad. If you’re trying to empower students to use the Internet to gather, evaluate, and use information, a tool such as Pocket is indispensable for keeping that content organized and available as needed. Go to the App Store on your iPad, search for the Pocket app, and download the iPad version. Tap the icon to start the app. The app prompts you for your account information. Either tap to open an account within the app or go directly to Instapaper and open your account there. It’s a good idea to have an account so that you can log in on any device and access your Pocket content. Install the bookmarklet or email contact. After you have your Pocket account, ensure that you can save pages from any device or computer. Installing a bookmarklet in your browser — a button that sits on the browser toolbar — is the simplest way to save pages on your laptop or desktop. It’s a little more complicated on your iPad, but you have some alternatives there as well. Desktop browser: Go to Pocket and log into your account. Click the How to Save link on the top menu bar. Follow the instructions in the Save to Pocket from Your Computer section to add an icon on your browser’s toolbar. Mobile Safari: Open the Pocket app and tap the Pocket menus icon — the lined icon in the top left of the display — and select Help. Tap How to Save and scroll down until you see the From Mobile Safari option. You can install the bookmarklet in Safari by tapping the Install button. It starts your browser and steps you through the process. Saving via email: Add Pocket’s add@getpocket.com email address to Contacts. Go to the Help menu, tap How to Add, and you see Save Via Email as one of the categories. Tap the Learn How button and follow the directions to add Pocket’s email address to your address book. Add pages to your Pocket library. Using the bookmarklet: If you’ve installed the bookmarklet on your browser toolbar, simply click the Save to Pocket button when you’re on any page you want to save for later reading and it’s added to your Pocket library. It couldn’t be easier. Save from other apps: Over 300 apps connect to Pocket. Tap icons to save content to your Pocket account from within apps such as Twitter, Pulse, Zite, Flipboard, and more. Using email: You can email any page to Pocket’s add@getpocket.com email address. Pocket recognizes your email address as the sender and files the content in your account. If you have added the Pocket email address to your Contacts as described in Step 4, tap the Share arrow on the top menu in Safari and select Mail. An email message pops up with the URL of the page in the body. Start typing Pocket in the To: field, and Mail recognizes the Pocket email address and offers it as the default addressee. Send the message, and the page is added to your Pocket library. Tap to open the Pocket app and browse through your library. Your list of articles is displayed along with the opening text for each. Select any article by tapping it. 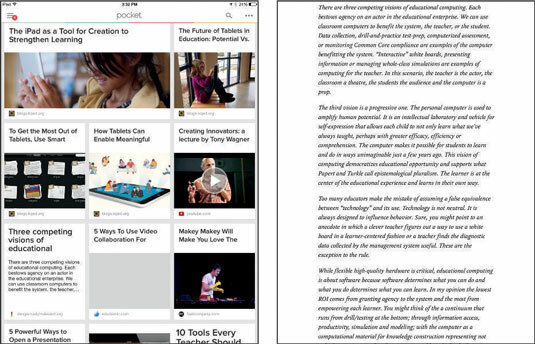 The integrated reader presents the article in a clean format after stripping it of ads and distractions. Tag Articles: Swipe across any item with your finger, and it reveals a menu of options. The first option allows you to tag the article for easy retrieval. For example, if you saved a recipe for Sweet and Sour Chicken, you may want to add tags such as Food, Recipe, and Chinese. Tap Tags in Pocket’s menu later, and select any tag from your list. Like or Archive: Swipe across any item and tap the star icon to “like” it and add it to your Favorites list. Tap the Trash icon to delete the article, or tap the Check Mark icon to save it into your Archive folder for later reference. Share: Your mother always told you to share, didn’t she? When you find an interesting article, it’s easy to let others know about it. Swipe across any item and tap the Share icon. Share the article via Twitter, Facebook, and a host of other social networking services. You can also send the article via email using the Send to Friend option. Search: Tap the magnifying glass on the top toolbar and type your search term. Pocket does a full text search through all the articles in your list. Use Pocket for simple, collaborative content curation. Open a class account for Pocket with your email as the primary account holder. Each student can log in to the class account and add a Save to Pocket icon on their web browser toolbar per the instructions listed above. You can also enable students to add content via email. Open your desktop browser and log into your Pocket account. Click the down arrow next to the Pocket logo at the top of the screen and select Options from the drop-down list of menu choices. Click Email Accounts and add the email addresses of students. Emails sent from any of those accounts to add@getpocket.com will automatically be added to the content in your group account.